A further extract from A Time of Gifts to mark the 85th anniversary of the “great trudge”. After a first faraway glimpse, the two famous steeples grew taller and taller as the miles that separated us fell away. At last they commanded the cloudy plain as the spires of a cathedral should, vanishing when the outskirts of the city interposed themselves, and then, as I gazed at the crowding saints of the three Gothic doorways, sailing up into the evening again at close range. Beyond them indoors, although it was already too dark to see the colours of the glass, I knew I was inside the largest Gothic cathedral in Northern Europe. Except for the little constellation of tapers in the shadows of a side chapel, everything was dim. Women knelt interspersed with nuns and the murmured second half of the Gegrusset seist Du, Maria rose in answering chorus to the priest’s initial solo; a discreet clatter of beads kept tally of the accumu­lating prayers. In churches with open spires like Cologne, one could understand how congregations thought their orisons had a better start than prayers under a dome where the syllables might flutter round for hours. With steeples they follow the uprush of lancers and make an immediate break for it. This entry was posted in Uncategorized on December 19, 2018 by proverbs6to10. An exciting new travel writing talent? It is rare for writers of the stature of Susan Hill to say “I was knocked sideways by this book”. 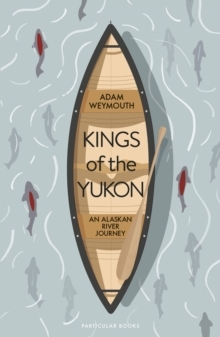 Author Kamila Shamsie thought Kings of the Yukon: An Alaskan River Journey , the debut book by young writer Adam Weymouth, “Dazzling, often in unexpected ways, Adam Weymouth is a wonderful travel writer, nature writer, adventure writer”. Travel author Adam Weymouth has scooped the £5,000 Sunday Times/Peters Fraser + Dunlop Young Writer of the Year Award for Kings of the Yukon: An Alaskan River Journey (Particular Books), about his four-month canoe trip through an Alaskan river’s remotest reaches, following “strong, excited consensus” from the judges. The author who lives on a 100-year-old narrowboat on the River Lea in east London was announced as the winner on Thursday evening (6th December) at a ceremony at the London Library. His debut, Kings of the Yukon: An Alaskan River Journey , follows his four-month “canoe odyssey” along Alaska’s Yukon river and the salmon who return to it, published by Penguin imprint Particular Books in April this year, after being bought at auction in 2015. “The result is a captivating, lyrical portrait of the people and landscapes he encounters – and an elegiac glimpse into a disappearing world,” prize organisers said, with judges comparing him to Patrick Leigh Fermor and author Robert Macfarlane. Sunday Times literary editor Andrew Holgate, revealed he had failed to spot Weymouth and believes fellow journalists also missed a trick. “It feels as if we have found, ready minted and hidden in plain sight, a really outstanding new contemporary British voice – one who literary editors (myself included; I plead guilty) almost completely failed to spot on publication.” the judge said. “I’ve never seen such a strong and excited consensus among the judges for a winner.” Kings of the Yukon has so far sold 1,365 copies in hardback according to Nielsen BookScan. The debut beat off competition for the £5,000 prize from the Women’s Prize for Fiction-shortlisted novelist Imogen Hermes Gowar for her debut The Mermaid and Mrs Hancock (Harvill Secker), Laura Freeman for her memoir about recovery through literature, The Reading Cure (Weidenfeld & Nicolson) and the Man Booker-shortlisted Fiona Mozley for Elmet (JM Originals), her Yorkshire-set debut about a family trying to find their place at the margins of society. Sponsored by literary agency Peters Fraser + Dunlop, the Young Writer of the Year Award runs in association with the University of Warwick. In addition to the prize money of £5,000, the winner is also awarded a 10-week residential course with the programme. All shortlisted authors receive overseas exposure through the British Council, the international partner of the prize. This entry was posted in Uncategorized and tagged Adam Weymouth, Kings of the Yukon on December 12, 2018 by proverbs6to10. “It was our King’s wish that he should go as a private pilgrim, with no trappings of state nor pomp of ceremony, … to visit the tombs … of his comrades who gave up their lives in the Great War,” so began my Great Grandfather, the Australian War Correspondent, Sir Frank Fox, in the opening lines of his endearing 1922 book, The King’s Pilgrimage, about a simple three day journey by train to the War Cemeteries of France and Belgium in May 1922 by George V, the King Emperor; a man of great humility, modesty and wisdom. About ten million combatants lost their lives in the First War, but it is the concentrated nature of the ‘14-‘18 conflict combined with the horrors of trench warfare, losses on a scale never experienced before and its wide reporting through the novel media of film that mean its effects are still felt to this day. Despite the fact that nearly double this dreadful figure were to be killed in the Second World War twenty years later, a far larger war conducted on many more fronts, it was as a result of the First War and remains to this day, commanders primary concern to minimize losses because of the negative and damning consequence such news and figures would have on morale at home and hence political will to see an operation through to its rightful end. There is no one alive in this country today from that generation who so readily gave their lives in the Great War for our freedom today. It was a marker that would set the precedents for the Second World War and the principles of liberty by which we stand today. But, we cannot possibly comprehend the enormous sense of grief that cast its shadow across Europe for a lifetime. It was in recognition of this great collective sorrow that the King undertook his humble pilgrimage, following his State Visit to Belgium in 1922. It may seem strange that it took nearly four years to make a journey of such importance, but the numbers of dead were on such a scale that it took time to agree the manner and locations in which they were to be honoured; again the first time that the nature and manner of burial was to play a significant role in war, largely due to the work of Sir Fabian Ware, one time editor of The Morning Post which latterly became The Daily Telegraph, whose lobbying led to the establishment by royal charter of the Imperial War Graves Commission, now the Commonwealth War Graves Comission. By 1922, construction of the War Cemeteries was advanced enough to enable the King to pay his respects and see progress for himself. Frank Fox, an experienced and tenacious journalist, had been reporting from battle fronts since the Boer War where he wrote of the controversy that created the Australian folk hero, Harry “Breaker” Morant; much of his work was for The Morning Post and it was his friendship with Ware that secured the invitation to accompany the monarch on this unique visit to the former Western Front. Fox was well qualified for this most sensitive of assignments, having been involved in many aspects of the Great War from its very outset when he was attached to the Belgian Army as The Morning Post’s War Correspondent when the Germans invaded Belgium in August 1914. For three months he reported the gallant Belgian resistance that culminated in the vital defensive action fought at the Battle of the Yser, which prevented the Channel Ports being overrun. On return, shocked by the atrocities meted out to the civilian population by German soldiers, he sought a Commission – at a relatively advanced age – and was sent to France as an officer in the Royal Field Artillery. In 1916, Fox was blown up in the quagmire of the Somme, taking him a year to recover from appalling wounds that left him almost totally deaf, with a shattered left arm and stump of a right foot. After convalescence, during which he worked for MI7 (Military Propaganda), he wangled his way back to France to serve on Field Marshal Haig’s staff in his GHQ at Montreuil-sur-Mer, where he assisted in the planning of the final offensive against the Germans. It was in this nonchalant manner that my Great Grandfather, the Australian war correspondent, Sir Frank Fox, described in his diary, the appalling wounds he received in the quagmire of the Somme in 1916. It has yet to be explained what a 42-year old Artillery Officer was doing at the very apex of the Front Line. It was the King’s express wish that the nature of the Pilgrimage be low key, with the minimum of fuss, entourage or the usual pomp and ceremony that were the natural accompaniment to an official visit by the Sovereign; further the journey was undertaken in the workman like order of khaki service dress, then the equivalent of combat clothing worn by soldiers in the field today; the King keen to be seen and identified in the uniform that his soldiers had fought and died in. It was very much a working visit, void of the formality, scarlet and gold of the previous few days in Belgium. On 11th May, the King left Brussels on board a special train that would be his home and transport for the three day journey, accompanied by a small party of five that included Field Marshal the Earl Haig, Sir Fabian Ware, Sir Frederick Ponsonby (Keeper of the Privy Purse), Colonel Clive Wigram (Equerry) and Major Seymour (Assistant Equerry). Later, he would be joined by Queen Mary and Admiral the Earl Beatty and at various points by representatives from countries of the Empire who played a vital role in the victory, Rudyard Kipling who was literary advisor to the Imperial War Graves Commission and had lost his only son, Jack, in 1917, while serving with the Irish Guards. The port of Zeebrugge, was the first stop, where His Majesty was briefed on the daring raid to block the harbour by the Royal Navy in early 1918. After, it was to the Cemetery at Tyne Cot on the Passchendaele marshes, a name synonymous with appalling casualties and the largest British Military Cemetery in the world, at that time the place was a building site, home to gangs of veterans preparing the ground, masons, architects and all manner of site labourers and gardeners drawn from the local populace. Yet, wherever the King went, despite his wishes to the contrary, crowds of well-wishers gathered, singing the National Anthem, children bearing posies of flowers, gifts of thanks and messages of condolence. It was the spontaneity of incidents such as this that make this pilgrimage such a unique royal journey, like no other, and for George V, it must have been a most moving, touching and humbling experience. At each cemetery, welcomed by local dignitaries, the King would dutifully inspect graves and a wreath would be laid before moving on. At Menin Gate, Ypres, he examined plans for the memorial to those who have no known grave; Vlamertinghe, Hop Store, Brandhoek followed until Lijssenthoek, the last cemetery in Belgian. Arriving on French soil, the King was met with considerable ceremony at Notre Dame de Lorette – guards of honour, colour parties and much of the French General Staff, led by the grand old Marshal Foch. ‘“I have come”, said the King as he took Marshal Foch by the hand, “to lay a wreath in homage on the tombs of the French heroes who have fallen for their country,”’ Fox wrote and, after the two minute silence, noted how the King, and those around him was deeply moved at the sight of ‘row after row” of French gravestones and the loss of “a complete generation … in defence of their country.” Later, the King, turned to Foch, in animated conversation with his old friend, Haig who he had endured so much with and asked, “Always good friends, yes?” The old Marshal grasped Haig’s hand in response and replied fervently, “Toujours, toujours” (Always, always). At which point, the King too joined in placing his hand over theirs. Queen Mary would join the entourage outside Boulogne at the final cemetery, Terlincthun, overlooking the English Channel, where 4,378 Commonwealth War Dead, including service personnel from Canada, Australia, New Zealand, New Foundland, the West Indies and South Africa are laid to rest. The Royal Party was greeted by a large delegation of French military and civil officialdom, whom the King officially thanked for their donation of land as burial grounds, support in construction of the cemeteries and sympathy for the great sacrifice made for French liberty. “The King’s Pilgrimage” by Sir Frank Fox, OBE, first written in 1922, is republished with the blessing of the Commonwealth War Graves Commission to mark the Centenary of the 1918 Armistice by his Great Grandson, Literary Executor and Wiltshire resident, Dr. Charles Goodson- Wickes. Dr. Charles Goodson-Wickes, served in The Life Guards in British Army of the Rhine, Northern Ireland and Cyprus. In 1991, while Member of Parliament for Wimbledon, he re-enlisted in the Army as a Lieutenant Colonel to participate in Gulf War 1 for the Liberation of Kuwait. Dr Goodson-Wickes, who lives in Bulford, was a driving force behind the reintroduction of the bustard to Wiltshire, is a Deputy Lieutenant for Greater London and the last sitting Member of Parliament to have seen active service. This entry was posted in Uncategorized on October 29, 2018 by proverbs6to10.